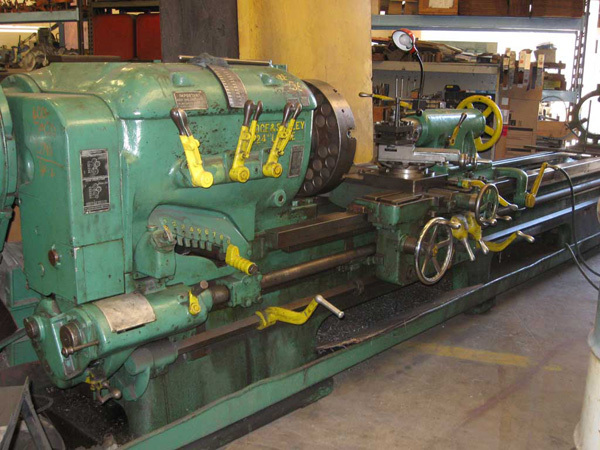 Lodge and Shipley 24" x 120"
Engine lathes saw their heyday during World War II. They got bigger, faster, and more powerful. 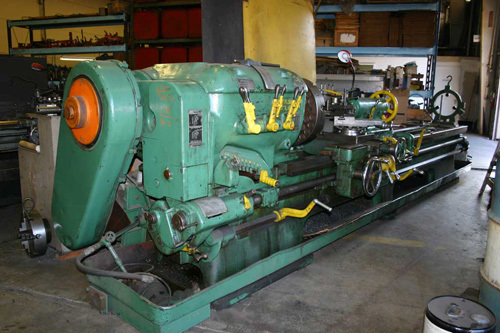 The Lodge and Shipley Model G produced roughly in the decade of the 1940's is one of the legendary lathes. Featuring the L-3 chuck mount, it was state of the art for stout. This version had but a small center hole through the spindle, (2") but other variants had much larger holes. Power was not a problem with a large motor on the floor behind the lathe. To further speed up production a rapid return feature was provided with a separate motor and a spiral feed rod on the back side which would rapidly return the carriage for the next cut. Designed for flood cooling, the entire lathe sat in a pan. They never made them better than this.